If you don’t have this box beside your furnace, you may have this annoying situation like I did of tripping over plastic pipes running along the floor to the floor drain. Or you may see one of these boxes in your house now and wonder “What the sam hill is that?”. Most likely you will be oblivious to most things that don’t have to deal with paint colors, pretty kitchens or bathrooms with jacuzzi tubs. Well I’m here to tell you that you should know what this is for two riveting reasons! Alright, I’ll be honest, it’s not even riveting to me but it is a reason for a post and I find many people coming to my blog site using “condensate pump” as a search term so I thought I would be proactive for once in my life. 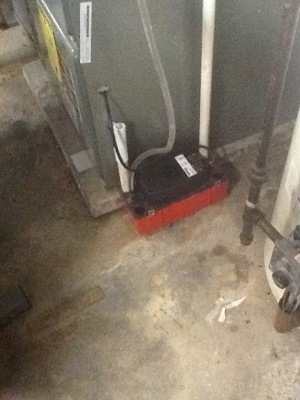 First off, what the heck does a condensate pump do?!?! Well, when either your furnace(sometimes) or your AC(all the time) run there is condensation produced. With an AC this is the moisture in the air which is why it feels reeeaaal good to walk to to an air conditioned house especially on a HUMID and hot day. I don’t want to go into more detail because that’s not what this post is about and I can mentally see your eyes glazing over. Condensation is also produced with the furnace running during the colder months but for a different reason. 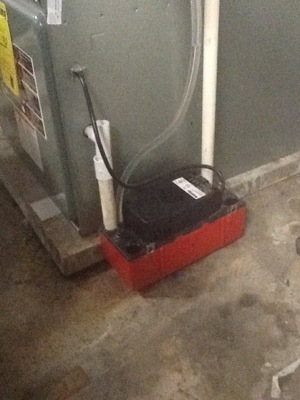 Now that we have that out of the way, why should you become familiar with the condensate pump? First off, it frees up floor space! I was constantly tripping over the plastic pipes running along the floor from the furnace to the floor drain. You would think I’d learn to step over it after about 8 years but noooo. I finally got so pissed I sawed the pipe off with a hand saw which only proceeded to cause water to run from the furnace to the floor drain along the floor instead of nicely contained in a ppe. I didn’t trip but instead slip on the water!! Problem solved! The second reason to become more familiar with a condensate pump has to do with when you finally have a pump installed or if you already do have one. You need to test it periodically. You do this by pouring water into the hole on top till the pump kicks on. I know it’s hard to see in this pic, you would think for all the money you pay for an iPad it could at least take better pictures?!?! There we go. Now all you peeps searching for condensate pump articles, absolutely thrilling reading let me tell you, have something to peruse.